Marlene Pinnock is seen in a photo provided by her attorney, Caree Harper (left). She was repeatedly punched by a CHP officer on July 1, 2014 (right). 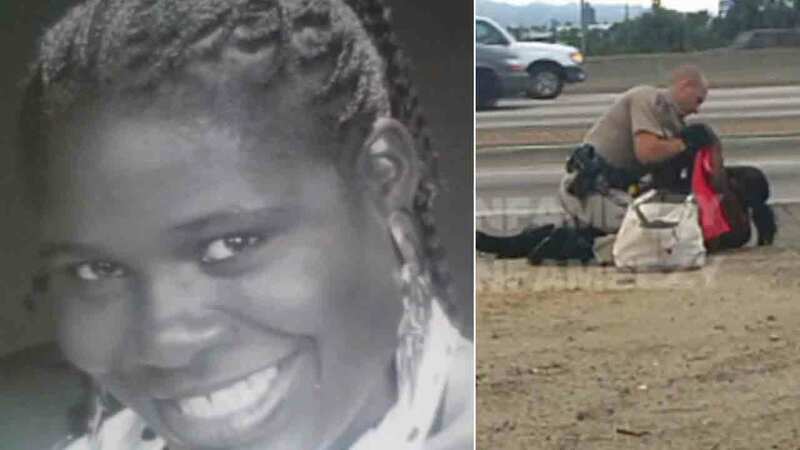 LOS ANGELES -- The mentally-ill woman who received a $1.5 million settlement after cellphone video captured her being punched repeatedly by a California Highway Patrol officer alongside a Los Angeles freeway was detained Tuesday, not too far from where she was beaten in 2014. Marlene Pinnock was spotted on the right shoulder of the La Brea Avenue on-ramp to the eastbound 10 Freeway in the Mid-City area at about 2:26 p.m. Tuesday, CHP said. Two officers detained Pinnock and transported her to Los Angeles County-USC Medical Center for a mental health evaluation. Pinnock's attorney, Caree Harper, has said that her client suffers from bipolar disorder. In July 2014, Pinnock was walking barefoot in and out of traffic lanes in the same area when CHP Officer Daniel Andrew tackled her to the ground and began punching her in the head. A motorist recorded the incident on his cellphone, and the videotaped beating went viral, causing controversy and outrage. Andrew, who had joined the CHP in 2012, resigned and Pinnock received a $1.5 million settlement. The CHP did not agree to wrongdoing, but rather noted the settlement would save taxpayers money from not going to trial. Harper said Pinnock had been off of her medication two or three months prior to the confrontation with Andrew. "On a daily basis, CHP officers encounter individuals experiencing mental health issues," CHP said in a statement released Wednesday. "It is important that law enforcement, as well as our communities, continue to support and provide appropriate resources to those who have mental health challenges and needs." CORRECTION: Earlier, we reported Pinnock had been arrested, but she was detained and transported to Los Angeles County-USC Medical Center for a mental health evaluation.